Perhaps it is because I have been doing Golden Retriever Rescue for only a year or perhaps it is my view on life but to me each dog has a story. This will be my attempt to relate the stories of some of the wonderful dogs that I have met. Cozmo&apos;s owner was no longer able to keep this older boy in his home. Although he had spent all of his nine years with this family, situations had changed and Cozmo needed a new home. 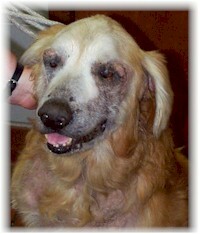 Where do you find a home for a nine year old dog who looks very old and frail? Amongst our list of adoptive homes was a wonderful woman who didn&apos;t care about his age or appearance. She drove all the way from New Jersey to look at this wonderful senior. When she got him home, she called to tell me how much she loved him and what a perfect gentleman he was, never getting on her furniture or bed. Nothing is too good for him. He now gets home cooked meals and regular exercise. The last time I saw Cozmo he looked like a young dog again! Sandals&apos; owner contacted us when his landlord would not allow him to keep his dog. Sandals is an 18 month old female who had lived in an apartment and had gone walking often. After a sad farewell she was given to us to be placed in a new home. I left her with her family at 6:30 P.M. and she went off to her new home. Early the next morning I received a phone call; "I don&apos;t think Sandals has ever run in a backyard. She is having so much fun and we really love her! Thank you!" I know that Sandals found true happiness in the home and yard of her new family. When you answer the rescue phone you never know what there will be. I received a call from a woman asking would we take her 4 month old puppy. What is the problem with him I asked. He chewed my carpet the woman responded. He&apos;s a puppy I told her. Puppies can get into mischief. "Well he has to go," she told me. I know that I have found a wonderful gift for the right family. He was placed less than 24 hours later to a family that loves him and understands that puppies make mistakes. If you have visited this site before you know that Cinnamon is a 12 year old male who was taken from the Hempstead Shelter. After several weeks in the animal hospital Cinnamon went to spend the month of August with one of our volunteers at her sleep away camp. What a wonderful gift to get to go to camp and be with a lot of kids. He is scheduled to be adopted this week and we really wish him well he is a very special dog. I was asked to go to the Brooklyn CACC and pick up a five year old unneutered dog. As I was leaving with Murphy the kennel person asked me if I had seen the other Golden . He was a one year old unneutered male. Could I leave him there? Of course not! I tried them together in the hallway and it seemed OK. I had a plan, put them in my car, count to 100, and if no one was bleeding I was going to start driving. We made it to the animal hospital in one piece. They were both neutered and were on their way home. One last thing Murphy needed a bath he was really dirty. We had him groomed and to my incredible shock there stood the most magnificent Golden Retriever. His coat was absolutely stunning. When his new family came to pick him up they did not even recognize him neither did I!